Top 10 MOST DANGEROUS Spiders In The WORLD! When it comes to a NOPE spider the word terrifying is one that instantly comes to mind. Sure spiders can be incredible creatures but many people get creeped out by these 8-legged arthropods. One person's cool is another person's horror. And when it comes to arachnids, no where is that more explicit than a NOPE spider. But to show we're not totally anti-spider (not quite yet, anyway), the above video runs through both some truly amazing spiders, but also some pretty damn scary ones that are more than worthy of the title NOPE spider. For instance it kicks things off with the so-called 'Silkhenge' spider, a remarkable arachnid (possibly with an interest in architecture) which builds silk towers as its web and contain a spider egg in each structure. The video then makes a leap to the nope spider side, as it presents us with the net-casting spider. It's also called the orgre-face spider because, well, it looks like one with its bulging eyes and weird lower jaw/fangs. 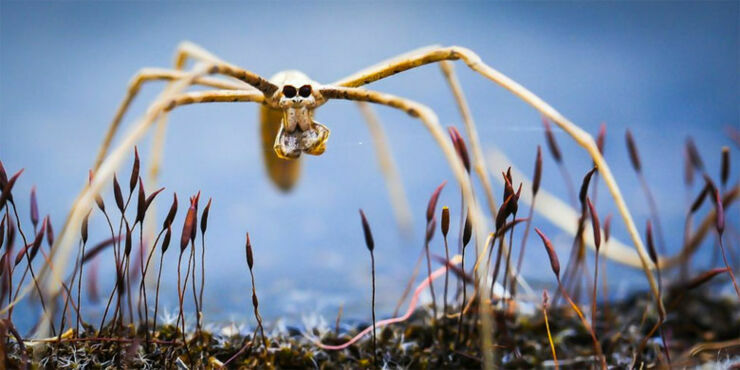 As f that wasn't freaky enough, they have long spindly Giger-esque legs and catch their prey at night (hence the eyes) by smoothering them in a silk net they hold with their legs. Also on the nope spider scale there's the Goliath birdeater tarantula which pretty much sums up everything you need to know in its name. The largest spider on the planet, it can grow to a foot across with fangs on its legs an inch long. It's a hairy-legged nightmare creature that will have you screaming just from seeing it in the video. It also throws urticating (stinging) hairs at its enemies. Because of course it does. Although that might be the largest spider in existence, there are other spiders that are equally freaky. And some that even hypnotize their partners into mating. Get ready to freak out BIG time. This video looks at the nine biggest spiders in the world, which includes the Camel spider, Colombian Giant Black tarantula, and the Hercules Baboon spider—the latter also happens to be the rarest NOPE spider in the world and hasn't been seen since 1900. Forget about Jaws, there's a whole NOPE spider genus of arachnids known as a fishing spiders. Semi-aquatic, they can walk on water and also detect vibrations on the surface through tiny hairs in their legs. This means if you're its prey, which can be fish, you're in trouble because once it detects you it can also breathe underwater to hunt you down where you live. Don't even begin to aks 'how' or 'why', the answer is just 'because'. Fortunately this NOPE spider hasn't evolved to hypnotize humans, yet. But for the male jumping spider, dating can be risky. Because if he doesn't suitably mesmerize his mate with some impressive moves and singing, she will "stab him with her poison fangs, and slurp out his insides." Why? Because some female spiders are like that. Portia spiders are not only cunning, but they use their cunning to entrap and then eat their fellow spiders. Firstly they entrance them by plucking strands of web to calm them, then then inject them with venom and eat them up. They are also remarkable for their intelligent hunting behaviour, which suggests that they are capable of learning and problem solving. And they can usually be found living under your bed. Ok, i lied. Under your pillow. Giant genetically modified spider found in Croatia!! This humongous NOPE spider was spotted in Dalmatia in Croatia and someone caught it on tape. But now nearly all the existing footage has been confiscated by local authorities, except this which has been viewed by over 5 million people online. Some people call it a coverup, other state its simply CGI. But can you be sure? You decide. Crazy Guy Plays With Giant Freaky Insect Called A Whip Spider And It&apos;s Pure NOPE!